Discover why Edraw is the simplest and easiest, yet most powerful office plan maker: Download it Now. 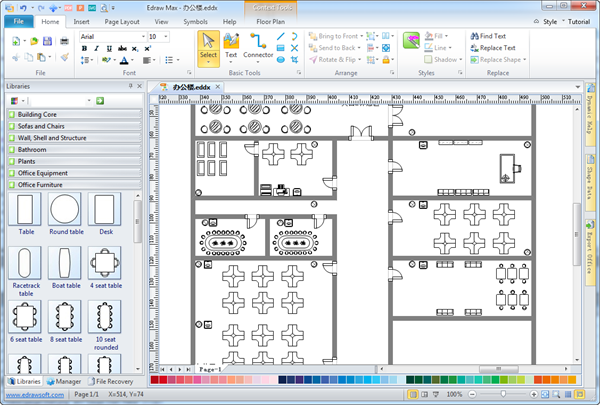 Edraw office plan maker is an all-featured yet easy-to-use diagramming program for planning organized and comfortable office layout. It is self-teaching with dynamic help saving you the learning curve. With the user-friendly interface similar to MS Office, you will get accustomed with Edraw soon. With over 6000 symbols, even beginners can create presentation quality diagrams by simply dragging and dropping shapes. Apply the built-in designed themes as the finishing touches, and then automatically transfer your finished office plan into other formats by only one click. Moreover, check out office floor plan software here.